This is a dish to stimulate your taste buds! 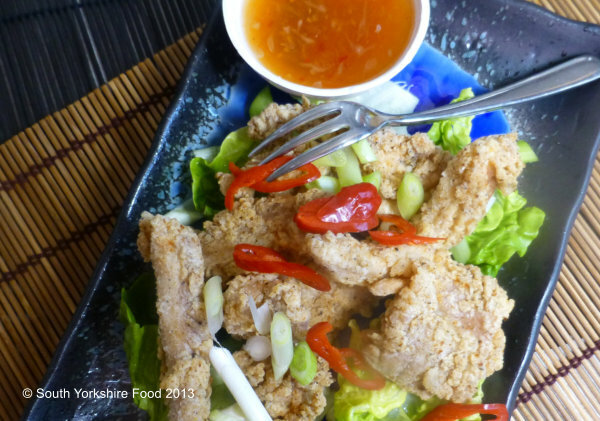 Crunchy Salt and Pepper chicken served on a bed of lettuce, with red chillies, and a piquant Chilli Dipping sauce. Delicious! Lettuce leaves, spring onions, and sliced red chillies for serving. 250ml ground nut oil for frying. Cut the chicken crossways into 5mm-thick slices. Whisk the egg whites in a large bowl until foamy, and starting to thicken a little. Add the chicken and toss to coat the pieces all over. Mix the corn flour, plain flour, salt, Chinese five spice, black pepper in a large bowl. Make the chilli dipping sauce, by mixing the lime juice, honey, sweet chilli sauce and fish sauce in a small serving bowl. Heat the oil to 180°C in a large saucepan over medium-high heat (when the oil is ready, a cube of bread will turn golden brown in 15 seconds). Add one-quarter of the chicken to the flour mixture and toss to coat. Shake off excess. Add to the oil, one piece at a time, and cook for 2-3 minutes or until light golden and cooked through. Transfer to a plate lined with paper towel. Carry on batches, with the remaining chicken and flour mixture, reheating the oil between batches. Arrange the lettuce on a serving platter and top with the chicken and scatter the sliced spring onion and red chilli on top. Serve with the chilli dipping sauce.